Description: Plumeria are beautiful landscape plants that would enhance any landscape. The flowers are beautiful and produce a wonderful perfume scent. Plumerias have thick stems, leathery leaves, and an abundance of flowers from early summer until fall. Plumeria’s waxy, 5 to 10 cm flowers are very fragrant, so plant trees close to windows or patios to enjoy the enticing fragrance. Plumeria can make a wonder landscape addition and well suited to potting culture as well. Plumeria is suitable for cut flowers. Plumerias are an outside plant. For best results, Plumeria need at least 6 hours of direct sun. They will grow in less sun, but usually don’t flower as well. You should water as needed, which in the winter is not much and in summer can be twice a day. When in doubt keep your plumeria on the dry side. 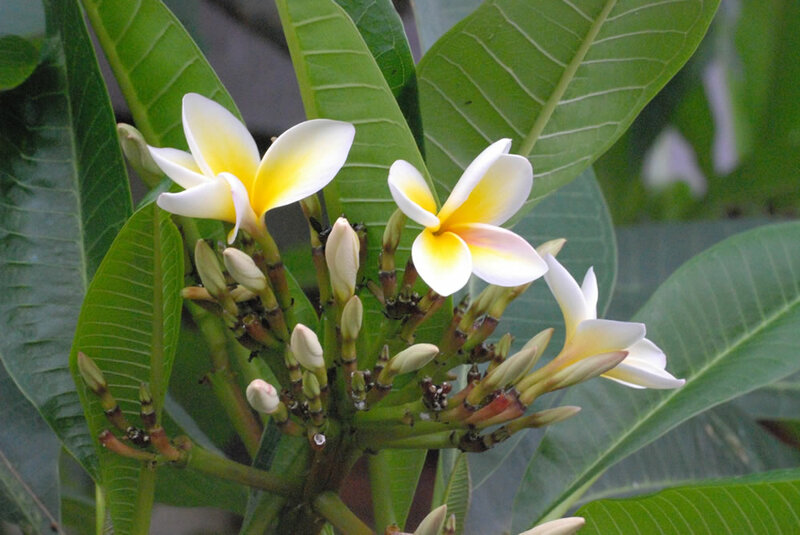 Use Phosphorus based fertiliser to stimulate the bloom of Plumeria. Ferilise it at least every two weeks during the growing season and NONE during the Fall and Winter. Protect Plumeria for temperature below 5C. Sansevieria trifasciata Laurentii Musa spp.